Take a second and marinate on the title: Life and Struggles. It is something we can all relate to with empathy and full understanding. So when I learned my fellow bookheart, Cassandra, published this unique book of poetry, I was eager to read it. Normally I am not a fan of poetry. A good friend of mine, Kristin Hemingway, and my favorite author Maya Angelou are exceptions. And now I must add Cassandra L. Hawkins-Wilson to the exception list. 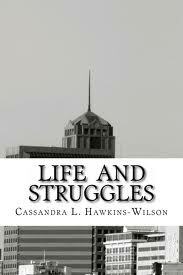 Life and Struggles is a collection of 67 unique poems. The poems spoke to me, comforted me, reminded me of life experiences, and took me on a journey of emotions. The author bared her soul through words. Lasting impressions, pieces of milk chocolate, longing for pleasure, gratification, surrender, hate, shame, confirmation, control and lust are just some of the feelings expressed in the poems. Oh, I had plenty moments of "Yasssss!" It is definitely a collection I will read again when poems are relevant to a situation I am going through. It helps to know someone else has experienced similar struggles and feelings. I thank Cassandra for writing this collection of poetry and am proud of her achievement. She put feelings to paper and shared it with readers. Well done! You can add this book of poetry to your collection by purchasing on Amazon. It is available in paperback and on Kindle.